The 2019 Brightlingsea One Design Programme is published and brings with it an exciting new competition! Thanks to the generous support of Dan Willett’s Geedon Construction Services and HD Sails every competing BOD will have the chance to win a brand new HD Spinnaker! Six events, including Pyefleet Week, have been chosen to be part of an exciting new lottery to win the spinnaker. If you take part in one of the selected races you will receive a lottery ticket for the draw and the winner will be drawn at the Final Fling lunch on Sunday 29 September. We have a great programme planned so join us for what promises to be a fantastic season. The Commodore and Flag Officers of the Colne Yacht Club would like to invite you to join them for the Laying Up Supper on Saturday 3rdNovember at 7pm. Prize giving will commence after the dinner. Please fill in the attached form and return it to Marianne by Monday 29thOctober. Please state clearly if you would like to be seated with a particular group and we will do our best to make this work. It was great to have eight boats out for the Andy Silk Salver on Sunday 30 September and what a fantastic race it turned out to be. Dave Conlon, Sarah Bines and Ed Gibbons showed us how it should be done in Windsprite, winning the race by what can only be described as a comfortable margin. But behind them it was nip and tuck all the way. Piers Lambert, Tim Bees and Andy Bines sailing Bidi had to fight off the advances of Alan Hicks and Fi Brown in Storm Petrel who in turn were challenged initially by Dave Bridle and Nigel Edmunds in Blue Peter and then by Mike and Imy Hare in Gelesma, with constant place changing throughout the fleet. On the line the Bidi team held their second place and Storm Petrel took third by just a few inches from Gelesma. Huge thanks to Matt Crittenden for running the race and to everyone for making the effort to get back out on the water. If anyone else is free do please come and join us as the forecast looks great and it would be lovely to give the boats one final good race before we pack them away for the winter. We still have the two final CYC events of the year ahead of us with the Andy Silk Salver at 14.15 on Sunday 27 September and of course the Final Fling on Sunday 7 October at 11am. It seems that we have a bit of a late charge for the Final Fling with Jeremy and Malcolm both confirming they will be sailing, I am out, Alan will be there and hopefully those of you who have been sailing regularly will be out too, so we should have a pretty good turnout. And of course let’s get as many BOD sailors and friends to the Final Fling lunch at CYC after the race as we can too. Even if you can’t sail do come and join us for lunch, which will cost £14.50 for the classic two course carvery lunch. Tickets must be booked in advance via Marianne White at the CYC Office on 01206 302594 or waterside@colneyachtclub.org.uk. Please also let Marianne know of any special dietary requirements at the same time. Whilst writing please also note that the BSC Laying Up Supper is on Saturday 27 October and the CYC Laying Up Supper is on Saturday 3 November. All BOD sailors are welcome at both evenings. 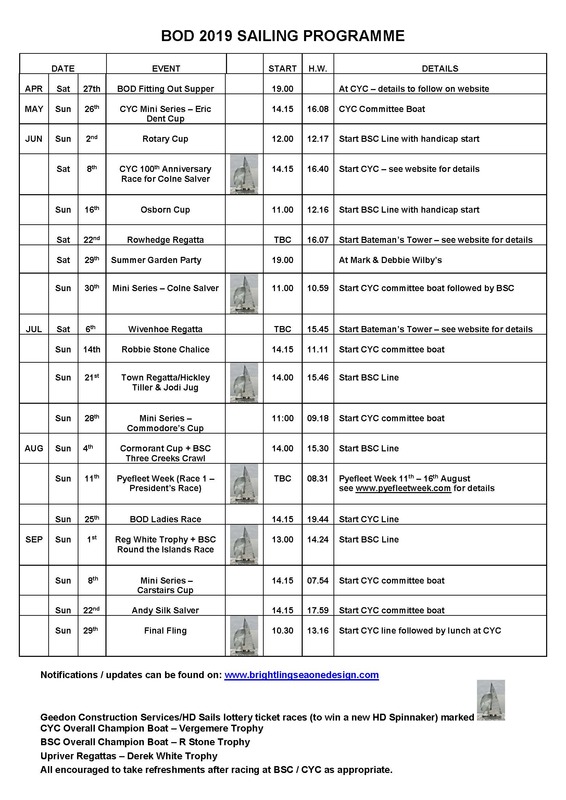 You can book for the BSC Event by emailing me (see details at https://www.sailbrightlingsea.com/event/237688) and for the CYC event please contact Marianne. 8 Boats turned out on Sunday (16 September) to be greeted with 18 gusting 25 knots of wind and a nasty chop for two windward/ leeward races. Nick Reddings, Matt Crittenden and Colin Willett set a short course in the estuary. Six boats got off cleanly on the first start with Sarah Louise helmed by Celia Charlton having to retire with a broken kicking strap and the Ruff boys being only two up wisely decided to head in. Mark white arrived first at the windward mark and held his lead for two rounds to finish 1st. Having sailed an exceptional race Mike Hare was 2nd with Dan Willett 3rd. Only Dan and Jeff attempted spinnakers but soon decided the boats had reached hull speed and there was no advantage. The second start again they all got cleanly away, this ended with a reversal with Dan 1st. Mike 2nd. Mark 3rd. All returned to the CYC for drinks and prize giving, with prizes of wine presents by Judith Gibbons. Thanks were given to the starting team. With a tie situation between White Magic and Bidi the result was decided on the winner of the last race. 1st Bidi. Dan Willett, Piers lambert, Stewart Philips. 2nd White Magic. Mark White, Derrick Gentry, Mat Wilby. 3rd Gelasma. Mike Hare, Max Hickman, Adrian Gibbons. Please note that the Ladies Race will now take place as part of the Woolvert Tankard all in handicap from the BSC start line at 2pm tomorrow (Saturday 1 September). You will be scored in the overall race, in the BSC overall ladies race and in the BOD ladies race. Course cards and instructions from BSC. Please remember to sign on and off at BSC. Learning & Skills Solutions Pyefleet Week Ahoy! C1 – Jean – Clive Goodwin will be defending his title! C24 – Nan – Dan and the King Boys are back in the fleet and borrowing Nan once again! C55 – Wind Sprite – Fresh from graduating, could Maddy be the first lady to win Pyefleet Week BODs in the modern era? Sadly Egret isn’t with us due to Danny’s arm injury and Jeremy fears he may not be able to escape work, but we’re an almost full house so bring on the fun and games. If you launch from Park & Ride please be ready to launch earlier than usual and allow plenty of time as there will be a lot of boats to get into the water. Here’s to a fantastic week!